Tile is typically found around the perimeter of a pool or spa at the waterline. 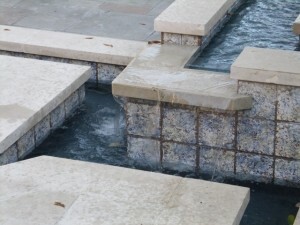 Other applications include raised walls, spa spillways, and even trim or spotter tile on benches and steps. Some pools are completely surfaced in tile. Changing your tile can completely transform the look of your pool and hardscape, whether you prefer a decorative look or a look that blends into the surrounding features. There is a wide range of tile looks and pricing, depending on the material chosen (porcelain, ceramic, glass, etc) and the manufacturer. There is quite a wide availability of choices in the standard selection, those in the lowest pricing tier. Equally as important as tile selection is the materials used to set and grout the tile. We use the highest quality of thin-set mortar and grout materials, and we use the appropriate one for the type and size of tile you choose. This helps insure the integrity of the installation and the lasting beauty of the tile, given the pool is maintained properly. At Select Pool Services, we strive for excellence in craftsmanship and customer satisfaction. Our methodology and attention to detail will allow you to relax and enjoy your pool once the work is complete. New tile can be a reflection of your style in and around your pool area. Call us today to set up an appointment with one of our superintendents.